Get ready to dive into the past - and maybe the future - on your search for the mischevious Wally and friends. This is the second Wally adventure. Lost for thousands of years. Hidden among thousands of people. Let the search for Wally begin...again! Wally-Watchers, get ready to dive into the past - and maybe the future - on your search for the mischevious Wally and friends. Full of eye-boggling extras and hours of fun, this second classic Wally adventure comes with a striking new cover. Wow! Amazing! Martin Handford's earliest influences were cinema epics and playing with toy soldiers, and at art college he loved to draw busy, militarily correct battle scenes. 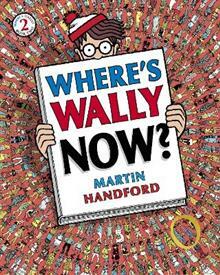 Each picture in his Where's Wally? books takes him months to draw. As I work my way through a picture, I add Wally when I come to what I feel is a good place to hide him, he says.